“When the opportunity came along to train with WA’s most highly regarded and knowledgeable equine massage therapy business, I didn’t hesitate to enrol and it has not disappointed. The workshops were always in-depth and interesting, and were also presented in an easy to understand format. The workshops covered a range of topics, from saddle fitting to nutrition to horse/rider biomechanics, all with the aim to help us be the best therapists we could. Any questions we had, and as Jess always said to us ‘there is no such thing as a stupid question’, we threw at Jess and she always helped us through the situation. Jess is 100% committed to helping and supporting us, the students, throughout the course. I am so grateful that Jess made the certificate available to the people of WA, as I am now living my dream and working as an equine sports massage therapist, with thanks to Equestricare for making this opportunity accessible. “I’m currently completing the Equestricare Sports Massage course and I’m LOVING it! Id previously gone to a couple of Jess’s short workshops and got hooked on them! (I ended up doing every single workshop or clinic that Jess had actually run!) I was learning SO much to just help my horses, and started to really piece together an understanding of how the horse works together as a whole! It REALLY opened my eyes to things I hadn’t even really considered before! And Jess made it all so easy to understand and relate to that I was starting to actually UNDERSTAND things like anatomy, conformation, sore muscles and everything! I was one of the ones bugging her to actually run a professional course and as soon as she mentioned it was finally in the making I signed up! Through Jess & Equestricare and this course I’m constantly learning and understanding more and more and REALLY enjoying it! I’m totally addicted to conformation & anatomy now! When I started I didn’t have much of an idea about all the fancy scientific names and terms but Jess makes it so anyone at any level can start picking it all up! She’s happy to answer my billion-and-one questions at ANY time (and I *always* have plenty LOL) and has leaders in all the different connecting professions as speakers and everything and who are also all REALLY supportive! So at the end when we get our certification we have a multitude of different directions that this can all lead us in! It’s also opened my mind to opportunities down different avenues than I had originally never even considered! “Having been around horses all of my life, I guess it was only natural that I would eventually combine my passion for horses with work. When I discovered the Equestricare Equine Sports Massage Certificate, I knew that it was just the course I was looking for. The self-paced online learning was perfect for me, as it enabled me to complete the theory components of the course around other life commitments. The practical component was extremely well taught and really solidified and expanded on the theory component of the course. Not to mention it was a great fun week where I met a group of wonderful like-minded horse enthusiasts, who I am still in touch with now. Since graduating, I now run my own business as an Equine Massage Therapist in the Yarra Valley, east of Melbourne. The Equestricare course has given me so much knowledge and continued support, as well as an immense opportunity for ongoing professional development. “Three years ago I was looking for a course to expand my equine knowledge and came across a course run by Equestricare called Basic and Intermediate Equine Massage. Having had Jessica Blackwell Lloyd out to treat my horse and discovering he had a sore poll and back, I decided that if I could manage to learn these techniques I might be able to help my own horses. I thoroughly enjoyed the horse and learnt so much, I had previously had some exposure to equine massage before in the UK, but this was in a completely different league. After I completed the course, I tried to use the techniques I learnt on my own horses and horses in my care. They all seemed to enjoy their massages and definitely benefited from them. In 2011 I started looking for a more in depth course I could enrol into, but to my dismay found most of the courses based over East, on line without any practical’s or ones focusing on racehorses. I continued searching for a course until in 2012 I received an email from Equestricare regarding the Equine Sports Massage Therapy Certificate. After a lot of investigation and making sure I had the funds available, I enrolled on the course and never looked back! During the course I have learnt about Equine anatomy, conformations, horse and rider biomechanics, equine nutrition, different massage techniques and tools as well as expanding my knowledge on Equine Physiology and Fitness. I thoroughly enjoyed the course; every workshop was fun and a revelation. I also made new friends on the course, all of whom have been supportive of each other and make a good team. All the course work was well set out and challenging enough to make me study hard. Every time I did more revision or attended another lecture or workshop I learnt even more. The course helped me decide what I wanted to do in my future career, set up my own business specializing in Equine Fitness as well as treating horses by massaging them and using red light therapy. The course gave me the tools and techniques to enable me to do this and I received all the support I needed to enable me to complete this course and set up my own business. The highlight of the course was passing my practical examination and being awarded my certificate in Equine Sport Massage Therapy with other graduates. I now run Ebony Equine Fitness providing equine fitness programmes and have the pleasure of working with Equestricare providing Equine Sports Massages and treatments. “I would highly recommend Equestricare as a course provider. It doesn’t stop with the course, Jessica and her team run a very professional service and they are always available from the smallest of questions to the more challenging ones. I am continually learning from the support groups they have for students and completing the course has let me work doing something I love. “When I enrolled to start the Certificate in Equine Sports Massage Therapy I had no idea where it would lead me. To be honest, I never considered it would become a career, I was simply interested in expanding my knowledge for my personal benefit. It had been a lifelong dream of mine to run my own business in the horse industry but over the years of hearing how it is too hard, and there is no money in it, I gave up on that dream. It was not until I started going out to see case studies that I realized this was the pathway to running a successful business in the equine industry that I had been waiting for. I loved every minute of being with my case studies and absolutely thrived when the positive feedback started rolling in. I had been going through some struggles with my own horse, but throughout my studies I began to recognize how much he was struggling. Despite the fact I had other professionals telling me he was fine, just a typical OTT horse, I knew there was a deeper issue. I have had dealings with several vets now, including for clients horses as well as my own. Each time, the vets have been quite impressed with my level of knowledge and my ability to accurately point out the areas of concern. “I treat race horses on a regular basis and some horses are extremely sore, the pain they are in is quite overwhelming. I would often take a deep breath and ask myself, “am I going to be able to fix this?”. I was not getting the results I desired so I was motivated to learn a different form of therapy. 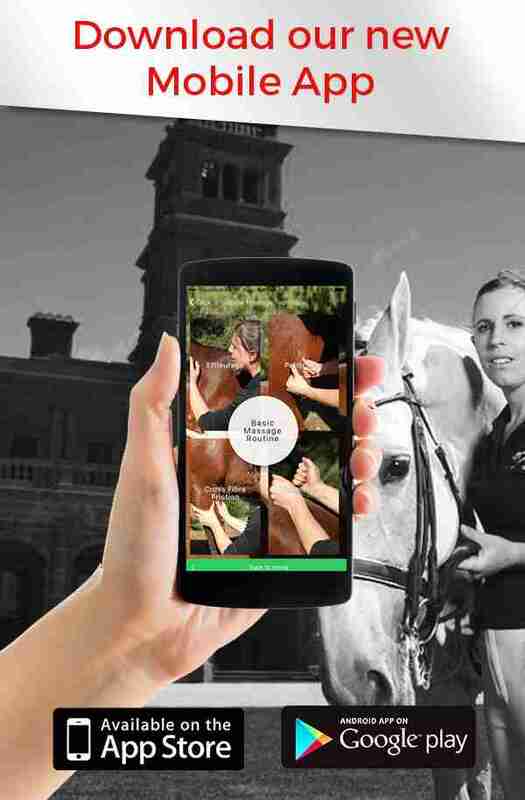 I contacted Jessica Blackwell at “Equestricare”, to come to Queensland to teach me her form of equine massage. Jess happily obliged. He improved tremendously over the next week. I assessed him again to find only a slight tightness along his back. His muscles had become soft and subtle. I gave him a follow up treatment a week later, and now the problems have diminished. “Thank you Jessica for developing such an interesting and comprehensive course for the Equestricare Sports Massage Certificate. In particular, thank you for making the course accessible to students from all over Australia. The course material and standards required were comprehensive and challenging and as a result, having successfully qualified with my certificate, I feel competent to begin working in the equine muscle therapy industry. I still have a lot to learn, but the ongoing support from yourself, your team and my peers allows me to find answers to my questions and gives me confidence to keep working and learning.